I never thought of chickens as pets. Heck, I never thought of chickens, period. And then a whole flock of them fell into my lap. I have my friend and neighbor, Elektra, to thank for that. Elektra Buhalis is an artist, working most days on backdrops and murals for Broadway plays and other large-scale productions. She also does freelance work, painting murals and landscapes in homes and on antiques. Her passion outside of the art world lies in the small slice of agricultural heaven she has built over the past few years. 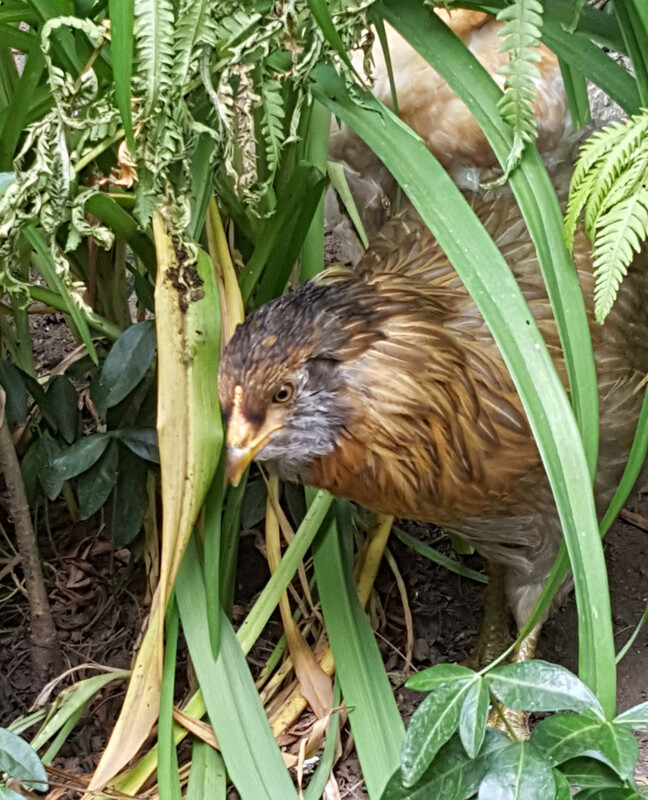 There are dogs, beehives, two Nigerian Dwarf goats, and the focus of this story: the chickens. Elektra has names for all of her chickens. Sometimes it’s simple, like Lemon (may she rest in peace), or it can have a great backstory. For instance, the black rooster seen here is Rafael, as in Rafael Trujillo, the dictator from the Dominican Republic. The Mirabal sisters — Patria, Minerva, Maria Teresa, and Dedé– opposed his dictatorship and worked to overthrow his regime. So naturally, four chickens are named after these brave women. Some other names include: CrowCrow Chanel, Sparkle, Homonculous, Golden Gorgeous George, Hecate, and Gandalf the Girl. Leave it to Elektra to be funny and creative! I often stop by Elektra’s to let her dogs out. 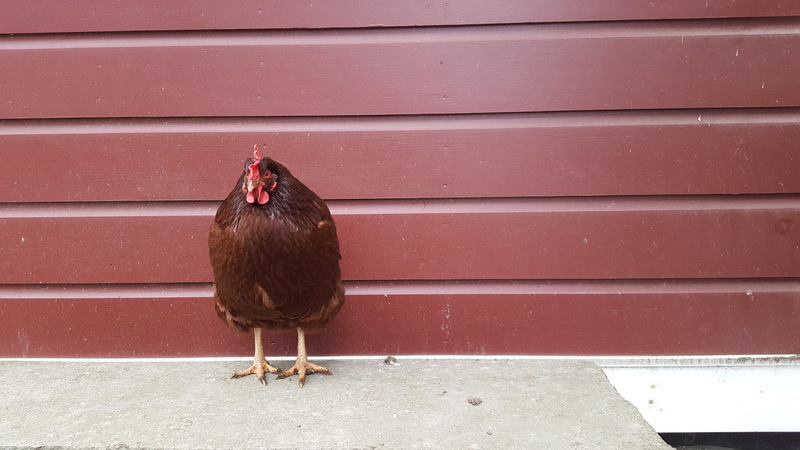 While I wait for them to do their business, I call out for the chickens to come keep me company. If there’s one thing I love, it’s watching a chicken run. All feet, no arms. It truly is a sight to behold. 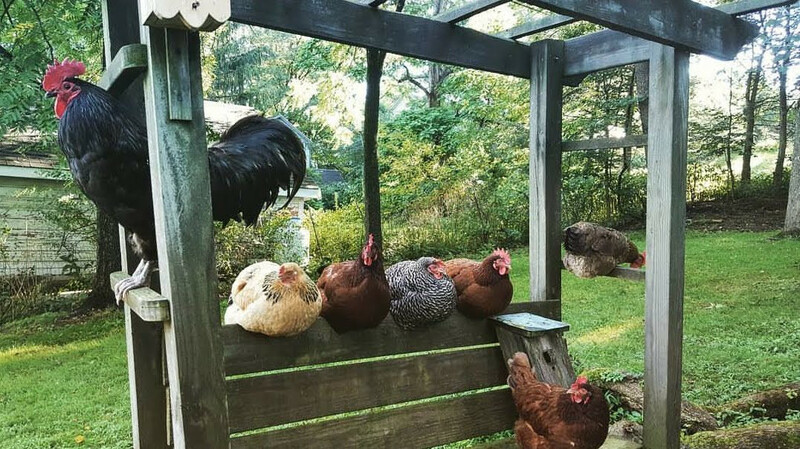 The Rhode Island Reds are by far the most friendly. 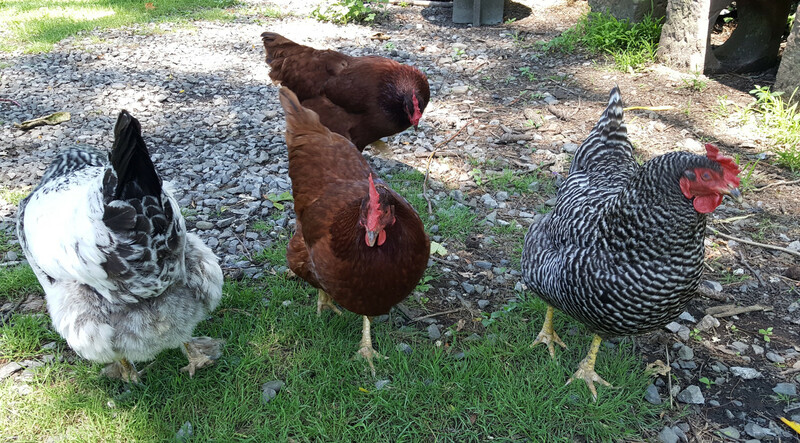 Princess Layer (center) and Curly (behind her) will usually come up to me and begin pecking my feet and legs in search for treats. They are so docile I can pick them up and pet them like cats. Cats that cluck. 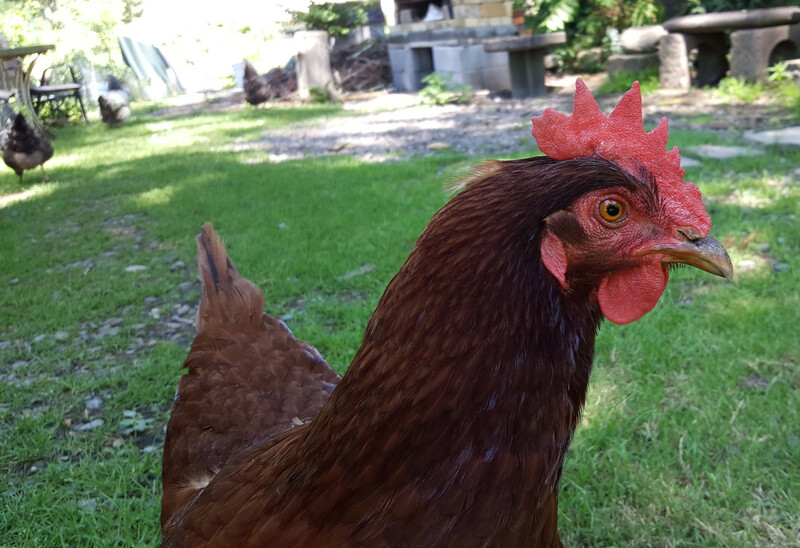 Like I said, the Red girls have no problem getting up close and personal with me, even if it means pecking at my camera. What a face! Some new, younger chickens have been added as of late. Ollie, seen here, will eventually lay the beautiful blue/green eggs of Martha Stewart fame. An important aspect of raising chickens is the coop. Most days, the chickens are free-range on Elektra’s property. 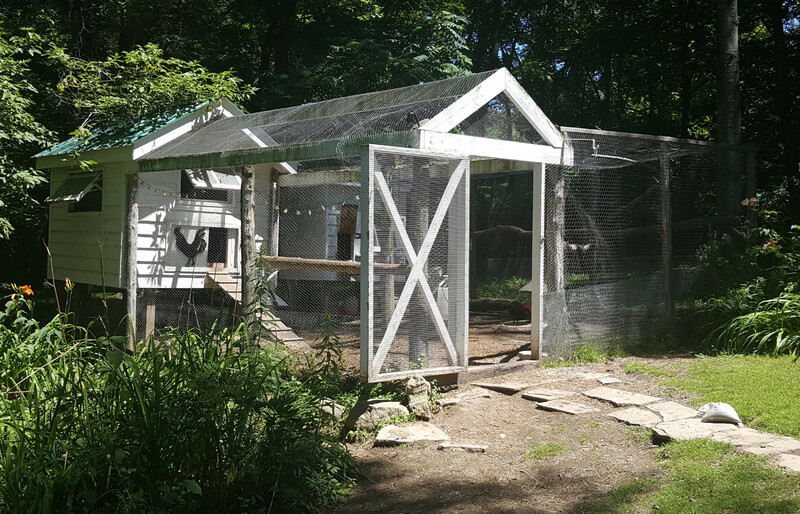 The coop stays open for them to access feed and water but also for protection from predators, like hawks. Chickens have poor night vision and will head to the coop as it grows darker. They coop is shut at night to keep all of them safe and sound. 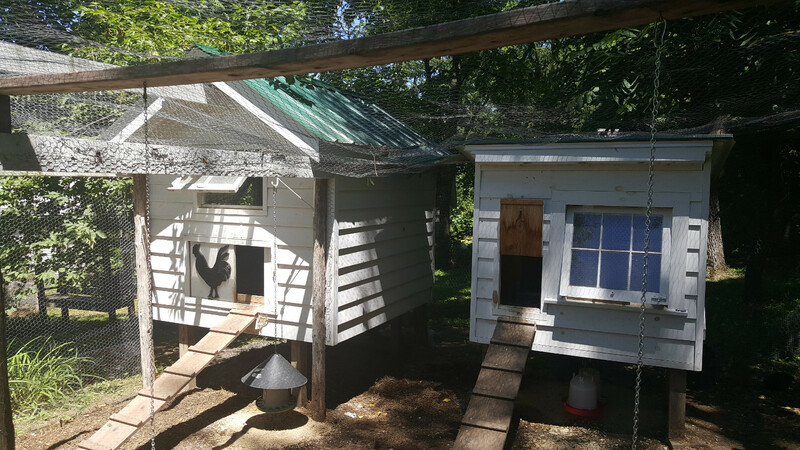 The smaller of the two coops (right) was built when more baby chicks were added to the group. It’s been used to quarantine birds who need some medical care or R&R. Lately it’s being used by one of the hens and the two chicks she cares for. 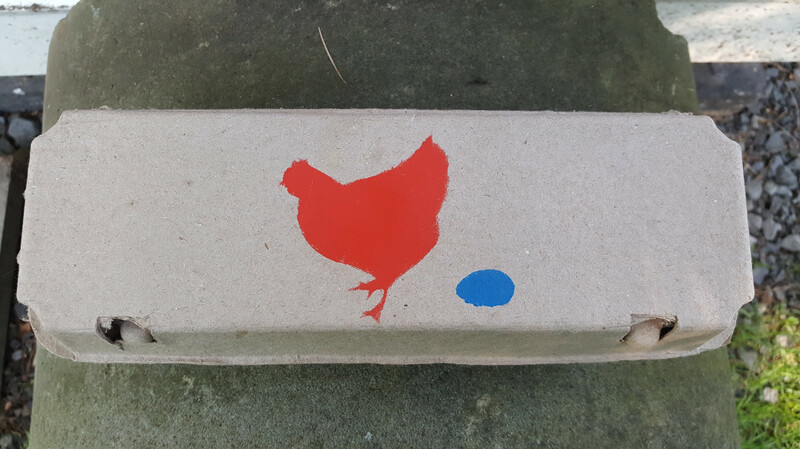 Ever the artist, Elektra created her own stencils to decorate her egg cartons. This is just one of the unique designs you’ll see if you’re lucky enough to enjoy eggs fresh from her little farm. 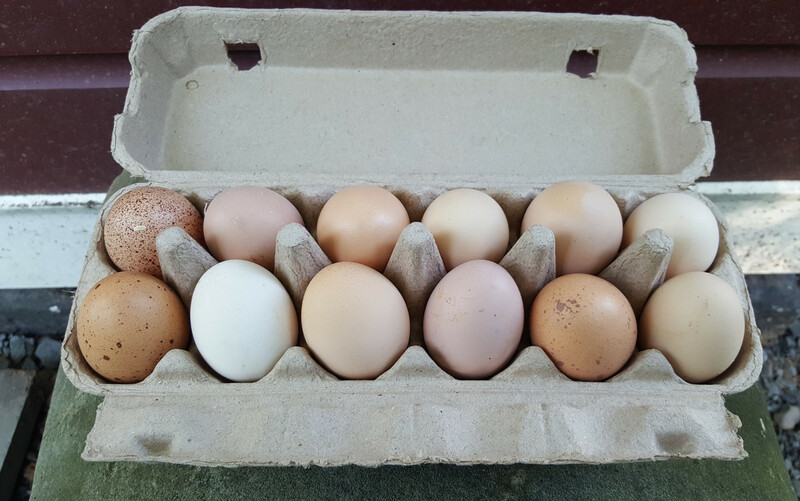 A dozen fresh eggs! Differences in color usually signify the difference in breed. It will be exciting to see how the eggs look once Ollie and the other new chickens start laying the blue eggs! Love this and love Elektra! Oh, they said this was too short a comment. Ok. 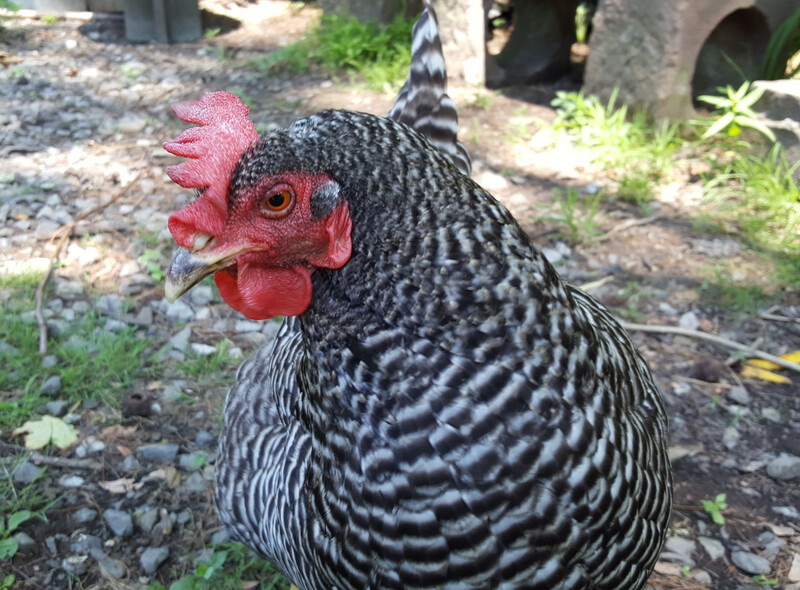 I loved the story about the chickens, how wonderful they are and the work that Electra does. Her page is something I eagerly follow… For all the gigantic corporate-ness of Facebook, Electra’s writing is a local event, intimate… whatever people may garner at a distance, it cannot compare with how this community is enriched by Electra, her friends, human and chicken and goat and Jesus and bees and oh my!! !